HOTELtelecom has been a leading supplier of hotel phone sets since 1989. As such, we will not knowingly be undersold. There's a reason we're among Scitec's top distributors and you owe it to your business to try us today. When it comes to selling hotel telephone sets, HOTELtelecom is the best name in the business! on any new hotel telephone we sell! 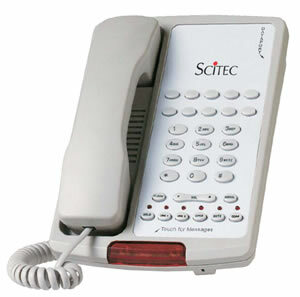 Scitec is an award-winning ISO-9001-certified telephone set manufacturer and preferred supplier to major hotel chains, hotel management companies and owners, and PBX system manufacturers. With six different product lines and over thirty-four different models, there is sure to be a Scitec phone for every hospitality application! The redesigned single and two-line Aegis-08 series is stylish and maintain all the standard hotel phone features. Single and 2-line hotel phones with handsfree speakerphone option in a variety of guest service configurations. Industry standard workhorse phones for your heavy-use areas. Available in standard, heavy-duty or modern stylings to fit into your operation. Buy your hotel phones from HOTELtelecom to get the best quality and best prices! We're among Scitec's top distributors, so try us today! Disposable, single-use phones are designed to reduce cross-contamination for better patient care.